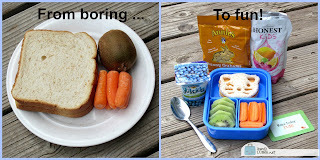 BentoLunch.net - What's for lunch at our house: Rock the Lunchbox Lunch Makeover! 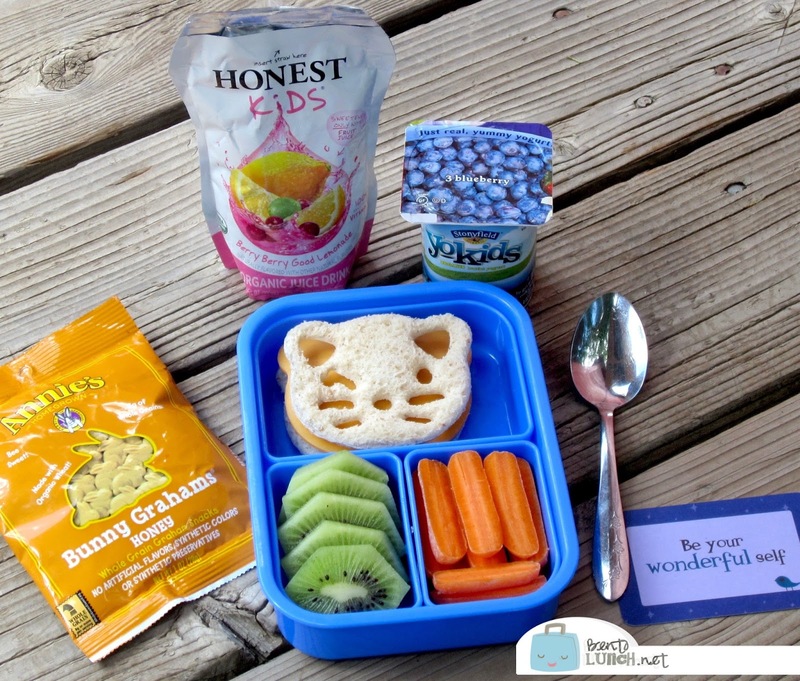 Rock the Lunchbox Lunch Makeover! Ready for a lunch makeover? 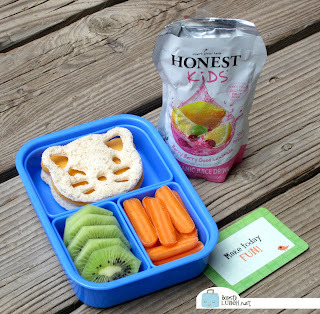 I'm participating in "Rock the Lunchbox" Back to School program, with Annie's food products, Organic Valley, Honest Tea (Honest Kids) and Stonyfield (YoKids!). They've found that the biggest challenge for parents is including desirable items kids want to eat that also keep well until lunch. And what ideas are parents wanting? 45% say making lunch cool and fun, while 41% say food pairing ideas. Today, I'm transforming a basic lunch into one that's a lot more fun! Up on the left, we have a ham and cheese sandwich on honey-wheat bread, some carrots, and a kiwi. It will taste just fine, and I'll probably add a cookie or muffin to it, but it's still kind of blah. So, let's make it better! 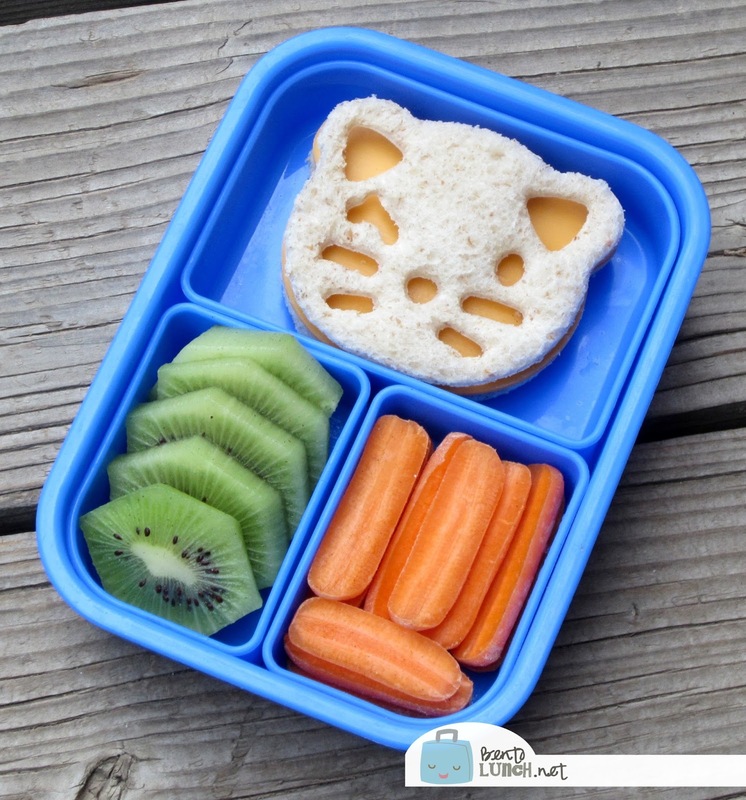 First, transform the sandwich with a fun cutter! (Save the scraps for egg in a hole for breakfast too.) I used my CutezCute cutter for the kitty sandwich. I also sliced the carrots and sliced the kiwi, which adds color, along with getting rid of the plate, or sandwich bags as the case may be for school, for a bento box! This box is by Paperchase from Border's a few years back, but there are tons of great options. Next up, we need a drink. The kids love both the Honest Tea Berry Berry Good Lemonade and the Organic Valley single serve milks. They also make a nice change from our standard water bottles. Also added is a Lunchbox Love note, which has a happy note and a fun fact on either side! 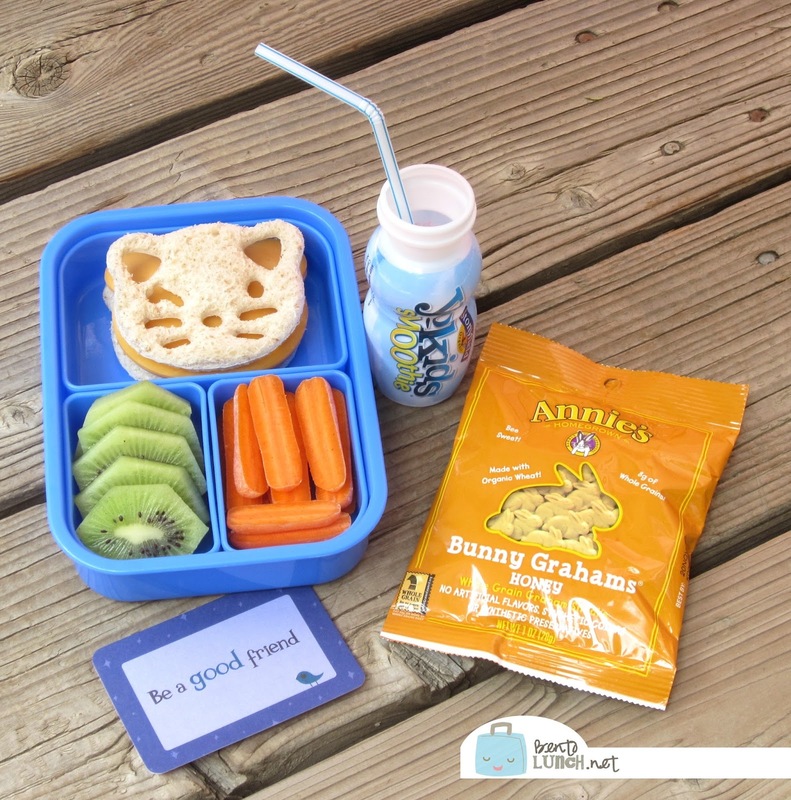 Next up, we added some Annie's Bunny Grahams to our lunch, along with a third drink possibility--YoKids Smoothies! I'd still add water with this one too, my kids will drink yogurt drinks separately, because they love them. What else? Since we went back to the Honest Tea lemonade for this lunch, we added a YoKids organic yogurt cup and spoon to round out the meal. 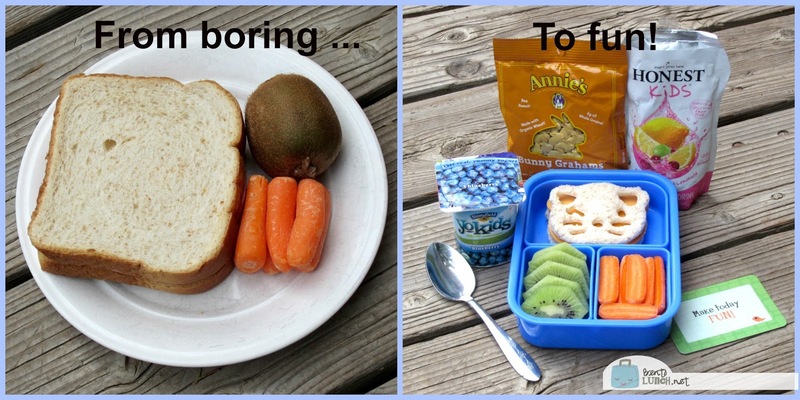 The separate snacks are especially handy when kids have snacktime in class separate from lunch, as both of mine have had this past school year. Visit Rock the Lunchbox for more great lunch ideas, to find coupons for some of the products used here, and to share your own healthy lunch ideas. 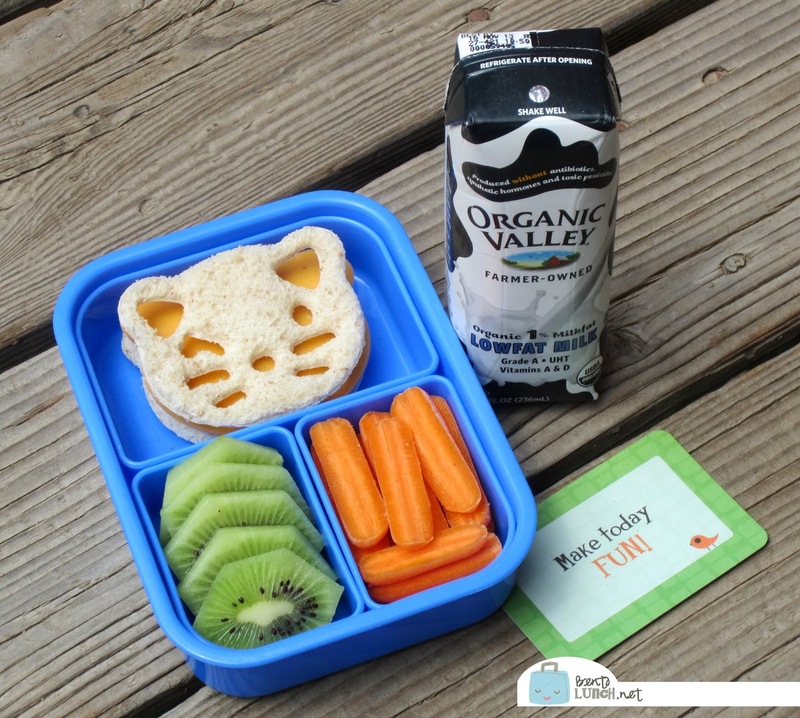 You can even enter to win a great lunch prize pack from Annie's Homegrown, Honest Tea, Organic Valley and Stonyfield (YoKids!) for sharing your healthy lunch picture. Just found your site yesterday - love this post for its adorable result that isn't over the top. I want to make my kids lunches appealing but I'm frequently packing lunches at 10 pm so making a full scale theme with tiny details is beyond me. These ideas are cute and completely attainable for me. LOVE THIS! This is perfect for all those moms who see my bento lunches and say that they don't have time. Seriously, its so easy to turn something boring into something that will bring a smile to your childs face!